In this blog post, I cover the Grand Finale of the 3rd PNB Metlife Junior Badminton Championship (JBC 3), which took place on July 28, 2017, at the Thyagraj Sports Complex in Delhi. 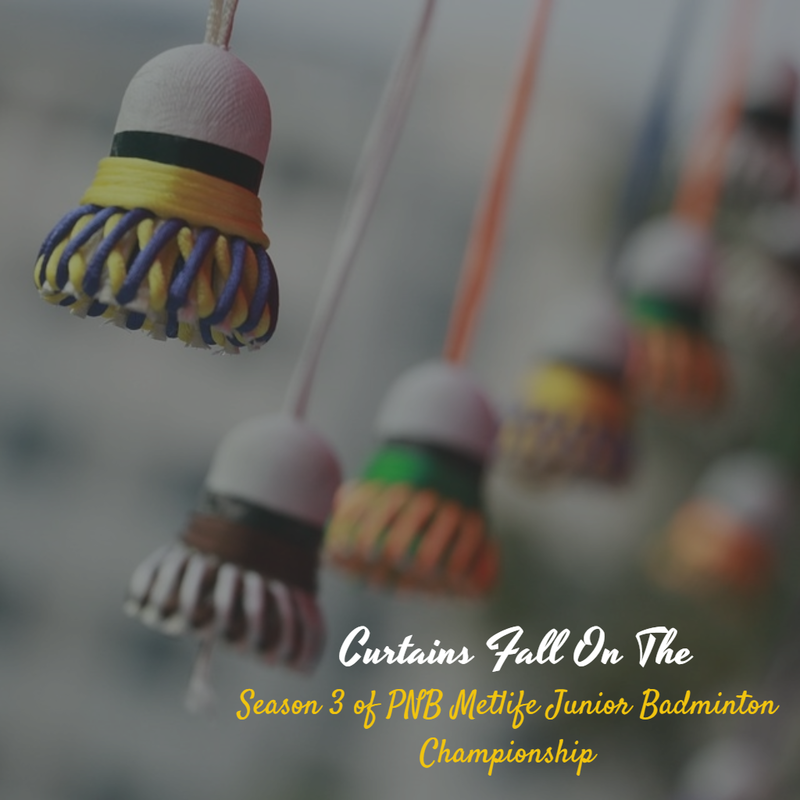 As curtains fell on the Season 3 of PNB Metlife Junior Badminton Championship (JBC 3), 10 young shuttlers were crowned as champions and 16 underprivileged children were granted scholarships for a year*. All winners in five age groups (i.e. U-9, U-11, U-13, U-15, and U-17) were felicitated by the Chief Guest, Santosh Gangwar, Minister of State for Finance, Government of India and the Guest of Honor, Ashwini Ponnappa, Gold Medalist at Commonwealth Games Delhi 2010 and Bronze Medalist at BWF World Championships, London 2011. In her speech for winners and participants, Ashwini Ponnappa encouraged young revelers by saying, "I am glad that Badminton, one of the most popular sports in India, has gradually seen an image shift from a recreational sport to a professional. I'm delighted to see these young confident kids play the sport with such finesse. I urge more parents to motivate their children in taking up badminton and appreciate organizations like PNB MetLife and Sara Foundation who have built national platforms for children at grassroots' level across India." Sameer Bansal, Director Bancassurance and Interim CMO, PNB MetLife, said, "Three years ago, PNB MetLife strengthened their proposition 'physical fitness is equal to fiscal fitness' under the umbrella brand of 'PlayForHappiness' with the launch of initiatives like PNB MetLife Junior Badminton Championship and PNB MetLife Satara Hill Half Marathon. I am delighted to share that as a brand, which values health, wellness and encourages family time and teamwork, we have been taking up the cause of badminton in a big way." He further added, "I'm proud to say that the JBC tournament has grown from strength-to-strength becoming one of the biggest annual national open-platform for young badminton enthusiasts to have hosted over 15,000 children cumulatively from all three seasons. The tournament has been applauded and graced by several Olympic, World, International, National players and Champions apart from eminent personalities from all walks of life. I would like to take this opportunity and thank our partners Sara Foundation and CRY for their support, hard work and dedication to make JBC a successful tournament." Ashish Srivastava, Chairman, JBC Organising Committee, said, "We are happy to see the consistent exhilarating response from participants in this third edition of the tournament. This is a testament to the tournament's success and popularity of badminton as a sport in India. I want to congratulate all the winners who deserved this victory and all the participants who showed zeal and enthusiasm in their performance. We will continue identifying hidden talent in our country and provide these players a platform to showcase their skills. With support from PNB MetLife, we are moving strongly in the direction to and we will surely produce future badminton stars of India. Sara Foundation remains committed to promoting sports and will further strengthen our mission." Soha Moitra, Regional Director, North for CRY – Child Rights and You said, "We are glad to be associating with PNB MetLife's Junior Badminton Championship as the charity partner. Having worked to advocate children's rights for close to four decades, we have witnessed deprivation that children face in India. At the same time, we have also seen the change that ensues, when these children are given adequate opportunities and made to realize their full potential. Across many of our project areas, sports have been an effective medium of empowerment for children and transformational change has been witnessed, impacting not just their confidence but also educational indicators. The rigorous badminton training sessions with professional coaches for our children in project areas across cities will give them the exposure that they truly deserve and hopefully inspire them to stand up for their rights and work towards a bright future." "Also, PNB MetLife's support will further facilitate our efforts to ensure that children in India get adequate care, nutrition, quality education and are protected so that they can lead a happy childhood. Investing in children should be a priority, since a country's growth and development is best reflected by the state of its children", she added.